If you’ve recently looked into purchasing a web hosting services, you may have noticed many new types of hosting options available. Most hosting services are categorized into VPS, shared, dedicated, cloud, and managed WordPress. Managed WordPress hosting has become very popular recently as WordPress is considered the gold standard as a website platform. WordPress is an extremely versatile platform for creating personalized and beautiful websites/blogs. 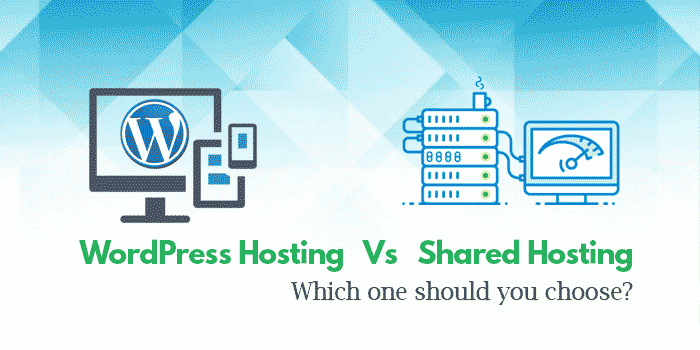 In this article, I’ll go through the top 5 differences between Managed WordPress and Shared hosting, and why WP hosting can be a make or break when it comes to ranking your site. Managed WordPress hosting can be more expensive but does offer a variety of benefits if you’re running WordPress – these differences are essential and should be taken seriously. Since Google penalizes you for a slow web page, ranking may be more difficult with shared hosting. New Update: If you’re looking into getting WP or shared hosting, check out my new discounts page. It has a fully loaded list of the top web hosting companies and codes for reduced prices. Managed WP Hosting is essentially hosting that is tailored and catered towards sites that run on WordPress. The reason for such specialization is because WP is considered the best platform for websites and blogs, and I highly recommend it for many small business website solutions (it’s completely free). Just to give you a sense of scale, out of the top 10 million websites, 30% of them were using WP… and that’s only considering the top 10 million sites. So, what exactly is being tailored when it comes to WP hosting? Security, speed, WP updates, backups, up-time, scalability, and usability are all being tailored and geared towards the WP platform if you decide to use Managed WP hosting. In addition to this, many hosting services will tailor their support if you ever get stuck with setting up WP. Everything you can imagine including the hardware and software of WP hosting is tailored for WP in order to optimize the sites speed (like fine-tuned caching). 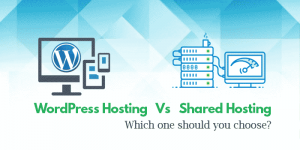 1.Speed is probably one of the largest differences between WP and shared hosting. It has been shown the these dedicated hosting servers can speed up your page loading time by 1-2+ seconds. You may be thinking that it’s just a few seconds but as previously mentioned, Google hates slow load times! And so do your viewers. longer load times could lead to a higher bounce rate and therefore lower sales or page views. This difference in speed could be a make or break when it comes to ranking in Google. 3. Infrastructure Flexibility. Since WP Hosting is only catered towards WP, using other systems such as Drupal, Magento, or Joomla would be an issue. If you plan on using something other than WordPress then this could be the tipping point. 4. Costs can vary significantly between WP and shared hosting. This can be an issue for those on a budget. But I wouldn’t be too worried on this front – I’ve seen many cheap hosting services that offer excellent deals of WP hosting. In my next article, I’ll do a thorough cost analysis on the different WP Hosting services out there so that you don’t have to do all that research! 5. Security, uptime, and scalability can be significantly better on WP hosting. Unlike shared hosting, WP hosting services will perform a comprehensive security check on a daily basis. Daily malware scans, improved security protocols, and more attention and diligence are some of the things you can expect for this tailored hosting. If your site is growing quickly or has a decent viewership base then this enhanced security could be important. I’ll likely have higher uptimes. If you’re planning on running your very first site and are unsure about how fast your site would grow or whether or not you need the extra security and speed, then WP hosting may not be what you want. But on the other hand, if you really want your site to rank well and if you plan on putting in a lot of time and effort into your site then I would highly recommend WP Hosting, even if you’re new to this. Of course, you can always start with shared hosting as it has lower costs, and then move up to WP hosting once your site gains popularity. If you’re an experienced user who has a WP site(s) with medium or high viewership’s than this is a necessity. Shared hosting won’t cut it and could be dragging your sites ranking, viewership, and vulnerability down. Managed WP Hosting is a relatively new hosting option that all of the top hosting companies are starting to focus on. This makes sense as WP is the top blogging platform and is used by many businesses, small and large. Almost all aspects of Managed WP hosting will be better than shared hosting (speed, reliability, security, uptime, service) but it does come with a higher cost. That being said, hosting services these days are quite cheap. If your serious about running a WP-based site and want to ensure that it runs optimally, then I would recommend WP hosting. If on the other hand, you’re new to all of this and just want to try out running a site with minimal cost, then I recommend you use shared hosting until you get more experience. You can always switch to WP Hosting later on. Please feel free to leave a comment or email if you have any questions.